It was a cold day in January of 1937 in Poland. Motel was a young man who had just turned fifteen years of age. That day, Motel was walking out from his job carrying money he had just earned from working at very hard labor all day. Suddenly, he heard a noise of someone crying. Motel turned around and saw two children on the side of the road weeping. He asked them: "Why are you crying?" They replied "we have not eaten for two days, and we are very hungry and thirsty with no food in our house." Motel looked at them and said: "Don’t worry, come and follow me…I will take care of you!" Motel took out his hard day’s earnings, took them to the grocery store, and spent all his hard earned wages to buy food for the two poor children. Then, Motel stood watching the two children eating and drinking – his heart was filled with joy. They turned to him and said with bright faces "Thank you!" Those children had never met before and parted their separate ways. When the young man Motel came home holding just a small piece of bread, his mother asked him "What happened today?" He recounted to her the events of the day. His mother replied. "Motel, you do that again and again- you should take care of yourself first, you worked hard to earn the little money you have…. "That was Motel in his teenage years, that was Motel during his adult years, and this is Motel - Mordechai Arkin that we bid a sad farewell to today. Dear family and friends, although The Almighty has granted Motel with 87 years of life, it is still very hard to bid farewell to him. It is still difficult to say goodbye to our beloved Motel. Motel was his Yiddish nickname; Mordechai his Hebrew name, Max was his English name. Max Arkin was born November 6, 1921, two weeks after the Jewish festival of Sukkot, in Ozory Lithuania, Poland Belarus. 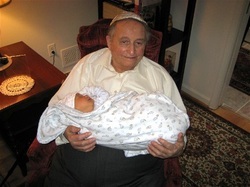 He was the oldest son born to Chenke Kaplan Arkin and Yudel, Yehudah Arkin. Two children were later born to the family, Miriam and Menashe. Motel’s family was very industrious and eventually prospered. The family valued education and thus ensured their son Motel was sent to the best schools. During the week Motel lived in Grodno, Poland and attended school. He was educated through the Tarbuth system which produced scholars of that time and those committed to the creation of a Zionist state, which we now call Israel. The history of WWII invaded Motel’s town and tore the family apart. At first the Russians devastated the community and upon their departure the Nazis invaded and Motel was eventually send to freezing Siberia. Imagine, there he survived eight years as a prisoner and laborer. He found his niche in the system and also learned about human behavior, and his very strong will to survive. Somehow, luck would find him and in May 1948, based on the plurality of his nationality, as a rehabilitated Polish citizen, Max Arkin was taken to the Polish border, and released. Tragically, his father was killed by the Nazis. Eventually, Motel found his way to a displaced persons camp in Austria where he met the love of his life, Judith and began the branch of this family. Judith and Motel were married for more than 57 years which in and of itself speaks volumes about their amazing relationship and bond that they shared. It is rare in our society today that two people are united in life’s journey as partners for such a long time. This is a legacy that they have created for all of us. Motel continued going on with his life filled with love and giving. These noble traits were due to the love, devotion and constant care from his wife, children, grandchildren and friends. Motel was a caring, loving father to his children and grandchildren—they considered him the best. He was competent, and compassionate. The family members speak with great affection and respect of their father, and of his patience with them. Judith and Motel did much together. Not only raising their children but additionally they volunteered, traveled and had a close circle of special friends. Max - Motel Arkin reminds us of the Biblical Joseph. They both as teenagers suffered greatly. Motel, like Joseph, fed the people, gave them food to the extent of the resources available to him. Motel, like Joseph, despite his suffering during World War II and afterwards, eventually became a compassionate and caring father providing for his family. Motel, too, rose from the pits of imprisonment, like Joseph, to start a new life and lead his people to a better tomorrow. The Torah was alive in Mordechai -Motel Arkin. Like the biblical Joseph, Motel was a self-made man. When Motel saw other people suffering he tried to help. When he saw a lack of justice he spoke up. Throughout his life, his attitude remained consistently positive. I had the pleasure to meet Motel Arkin when his son Uri became engaged to Sara Krimins of Annapolis. I found him to be a brilliant person who spoke six languages fluently and was willing to lend a helping hand and offer good advice without taking credit for it. Mordechai had a tremendous passion for prayer. Mordechai understood the concept of loyalty, devotion and consistent commitment to a shul, a synagogue and a community. Judith, it is known that your husband Motel loved you and respected you. It only reflects upon the great devotion, love and caring that you showed Motel throughout the years together. Motel was blessed to have you as his wife, his soul mate. He was so tremendously devoted to his children, grandchildren, family and friends. Motel – Mordechai leaves behind Children - Michele Arkin-Hodges married to the late Richard Hodges (this is a very trying time given that Richard was just buried on Jan 2, 2009), Jay Arkin married to Claudine Arkin, Uri Arkin married to Sara Arkin, a brother - Mike Arkin, and grandchildren - Tara Arkin Hodges who lost her father two weeks ago, Margot Hodges Rosenthal who is expecting her first child this week and just lost her father two weeks ago and Nathan Arkin, Ethan Arkin, Leah Hain Arkin, and Elie Arkin. I would like to share with you some words that the family members said at the celebration of Max – Motel Arkin’s 87th birthday: "Dad, we honor you today. We, your children, are grateful for your efforts, and are proud of your knowledge of history, Judiaca and world events. We know you are a man of high ethics and principled fairness. We are who we are because of you. In the face of great adversity you have succeeded."